The last thing I want readers to think is that this column is leading a one-man anti Ferguson campaign. 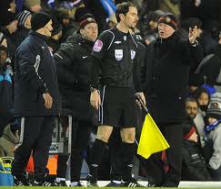 It’s just that Sir Alex’s latest verbal behaviour needs some clarification. The fact that Manchester United didn’t beat Tottenham two Sundays ago, he claimed was all down to the assistant referee, referring to an incident when Wayne Rooney went down in the penalty area. ‘Why he never gave a penalty, I don’t know,’ he is reported to have said. His other comments about never getting anything from that ‘side of the pitch’ and remembering that the same assistant ‘didn’t give us anything against Chelsea three years ago’, I leave to the FA to consider whether his allegations of bias is questioning the assistant referees integrity. The question his comments raised with me is what do footballers, supporters and officials think an assistant referee’s powers and responsibilities are, when it comes to fouls? As ever of course, it’s worth reminding ourselves what the Laws of the Game actually say and then looking at how it works in practice. Law 6, Assistant Referees, gives assistant referees seven duties, as they are called. One of these says, ‘the assistant referee should indicate when offences have been committed, whenever the assistant referee has a better view than the referee’. The first thing that is apparent from that is that the assistant referee doesn’t make any decisions; he only gives indications to the referee. We often hear people complain that the referee overrules or goes against the assistant’s decision, but the truth is that it is the referee who makes the decisions, not his assistants. The other point that I feel is worth making is that these seven duties of an assistant referee are subject to the decision of the referee. So for instance, in local football where the assistant referees are appointed by the teams and of course are members of each club, the referee will almost certainly choose not ask them to indicate for any fouls. Even at more senior football some referees might seek to limit their assistants’ activities in this respect. Years ago many referees would say things like ‘leave the box to me’ and you always do what the referee wants. Today, most referees when they have neutral assistants will be happy to receive indications of offences from them, if they have a better view. However, a referee will often request ‘give me first bite’. What he means is that he expects his assistants to wait a few seconds before raising the flag and at the same time look towards him. Firstly, to check whether he has seen the incident but is playing advantage. A flag in those situations will only serve to distract players. Secondly, to check his position. The referee may be further away but have a better angle. If we take the Manchester – Tottenham game as an example, the assistant would have had a quick look at where the referee was when the incident occurred. Premier League referees tend to run a narrow diagonal these days and the referee that day was close behind the players, although it happened wide in the penalty area towards the assistant referee. It was a difficult decision to make as Rooney actually kicked the opponent’s leg, which caused him to fall over. What’s more, the actual clash of legs was on the ‘blind’ side of the assistant and so the referee had a better view. No referee would welcome a flag in those circumstances. What we all want and what the guidance in the Laws of the game tries to achieve, is co-operation between the three officials so that the decisions will be the best they can be. No matter how good however, there will always be some old moaner who will complain.